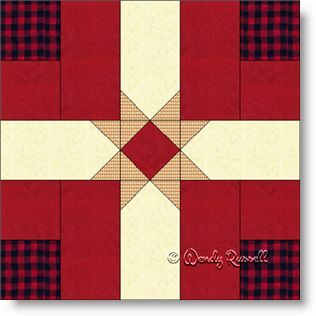 The Mother's Own quilt block is a perfect choice for a quilt to celebrate Mother's Day. It is an easy five patch block constructed using only squares and rectangles. "Ah ha!" you say. There are triangles used to make the star in the centre. Well ... yes ... but they are sewn using the "flip and sew" method which is so popular with quilters. No triangles are used. What could be easier? The block is sewn as an uneven nine patch, rather than in five rows of five -- (just an easier method, in my view). The two sample quilts illustrated introduce an additional fabric for the sashing between the blocks. This is not necessary, but I thought it added a little extra pizzazz to the sample quilts.